My lovely friend Barb from A Life in Balance and Frugal Local Kitchen is guest posting today! I have been working hard on trying to find some ways to keep the kids into a rhythm of learning over the summer and she is sharing one of these wonderful ways. Thanks Barb! As a guest poster for The Vintage Mom today, I’m sharing one of my favorite homeschooling projects from way back when which makes for a great summer academic project and reference for your kids – mini office lapbooks. They’re a visual way to pull together all the basic information a child should know or needs to know for a grade level. For the higher grades, a mini office can be used just for one subject like botany or american history. I like to make mine for my rising First Grader to ensure they retain the information they learned in Kindergarten over the summer break. Lapbooks basically are 2 to 3 file folders trimmed a bit and taped together. You can use visual design to present information. Mini books in the shape of an object are common. Colors can be used to organize the information. Pockets can be added to hold pictures for games or examples. If you have a writing student, you can include a sample of their work in a mini notebook. Since lapbooks are very graphic in nature, they’re a great project for preschoolers and Kindergarteners who may have limited writing skills. Take 2 to 3 file folders and trim off the bits to make them look like rectangles. I prefer the standard file folder; others prefer legal size to give them more room. I find the standard size stores better when it’s not being used. I also like to keep all my folders for the lapbook the same color. Just a thing I have. Lay file folders on the table with the inside up. Overlap the 2 inside flaps and tape the seam with clear tape. Turn over and tape outside seam with clear tape. I like packing tape because it’s wider than scotch tape, and less likely to peel off. You will have a 3-sided mini office that can be folded shut for storage. 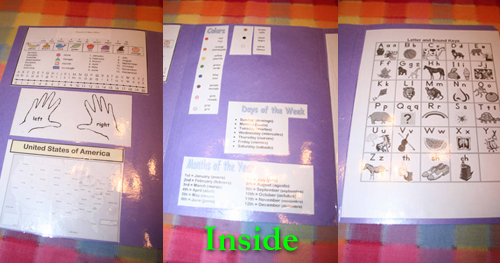 Print out what your child needs to know and organize the information in the lapbook. If you don’t have a lot, keep the printed information inside the lapbook. Otherwise, put the less important information on the outside flaps. 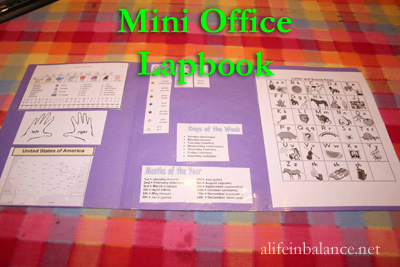 Kids will love to help you put the mini office lapbook together. Talk to them about things they think they should practice over the summer like math facts. If there’s words involved, ask them to write the words and help cut them out. If you’re including shapes for your preschooler, they can color them in. Don’t forget to personalize the lapbook with your child’s name. Laminate the lapbook for durability when you’re finished gluing everything in place. 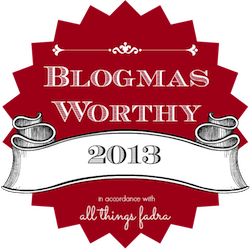 Barb is a mom of 5 kids who spends her day keeping track of socks, stuffed animals, library books, and a 4 year old when she isn’t writing about all the frugality, gardening, cooking, and reading she manages to fit in between the chaotic moments. She can be found at A Life in Balance or Frugal Local Kitchen.